Are you a perfectionist marketer? Perfectionism is defined as the state in which one is always striving for the best and achieving the highest standard and quality. As a perfectionist, creating a flawless social media presence is crucial when you’re trying to stand apart from others on Facebook. It is more than just writing an engaging message; it’s also about creating eye-catching visual assets that can capture your audience’s attention. However, if your images are too small or too large, it can distort the quality of your page, posts, and campaigns, thus turning away Facebook fans. That’s why Social Media Managers need to be extremely careful and ensure images are created and uploaded in the right size for the right places. 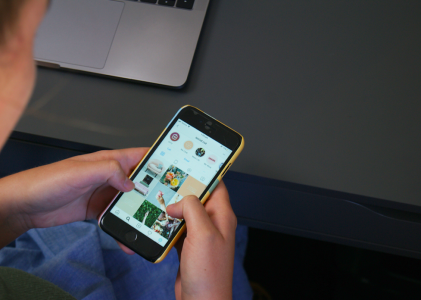 Consider right-hand-rail ads versus newsfeed or how images will look on mobile. The landscape of correct Facebook image sizes is vast. 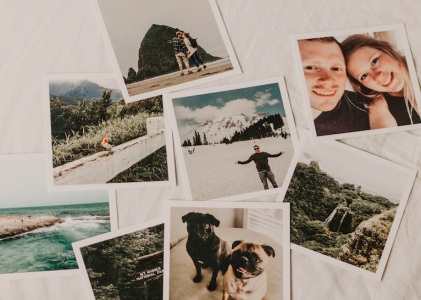 In this post, we’re going to look at all the different dimensions to perfectly optimize images for your Facebook page, organic and paid social posts. Your business’ Facebook page is considered your online storefront. When a person searches for your business’ name on Facebook, the first thing they see is your profile photo. As soon as they enter the page, they are also greeted with your Facebook cover photo. This is your first opportunity to leave a good impression for your visitors, so you want to get it right. 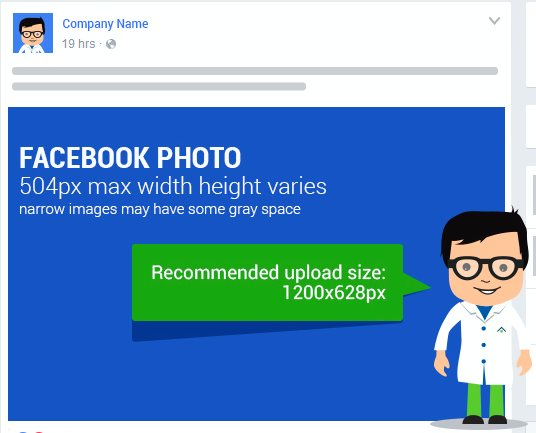 The recommended size for your Facebook profile photo is 170 x 170 pixels. While the image is displayed as 160 x 160 pixels on desktop and as 128 x 128 pixels on mobile, it is recommended to upload a slightly larger image. Any images that are wider in size will be cropped to fit the square. As for the cover photo, upload an image that is 820 x 312 pixels. Images that are smaller in size will be stretched and the quality will be distorted. A Facebook post is more than writing something witty for your audience to read. The visual assets in a particular post are just as important when you’re trying to draw your audience in. When sharing an image on Facebook, upload an image that is 1200 x 628 pixels. The maximum width of images on Facebook is 504 pixels, while the height can vary. However, images that are too narrow can cause grey space on the sides. When posting a link on your Facebook business page, do you upload a separate image or simply use the one that is fed through the article? More often than not, people use the default image that is fed through the article. While this is convenient, the images are not always optimized for Facebook pages or related to the content. In fact, they can create a small thumbnail or a stretched image that only shows a portion of the original article photo. Next time you post a link onto your Facebook business page, choose an image that relates to your content or recreate the images that are 1200 x 628 pixels in dimensions. By default, Facebook provides 10 thumbnail options when you upload a video. However, these images are taken from your video and may not always accurately depict what your video is trying to convey. To draw your viewer’s attention, try choosing an image that is related to the content of your video. Another great option is to create an image with the title of your video. 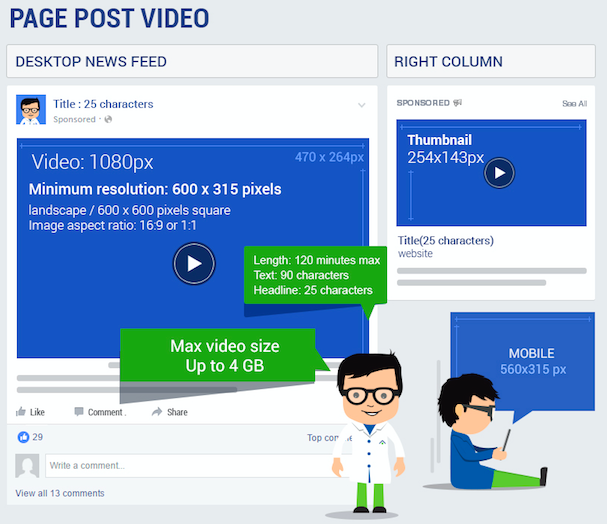 While the video file size can be a maximum of 4GB, Facebook recommends that the minimum width of the image be at least 600 pixels. Website Links and Offer Claims are types of Facebook advertising campaigns that can drive businesses and conversions to your website. Both campaign types have similar requirements for image dimensions. The recommended upload size is 1200 x 628 pixels with a 1:9:1 ratio. If images are too small, the image will be rendered as a thumbnail. Additionally, Facebook may display only the center-part of your image if the size is incorrect. Keep in mind that for all images on Facebook advertising, the amount of text allowed is limited. Before uploading an image, use an image text detector to ensure that it meets Facebook’s standard. 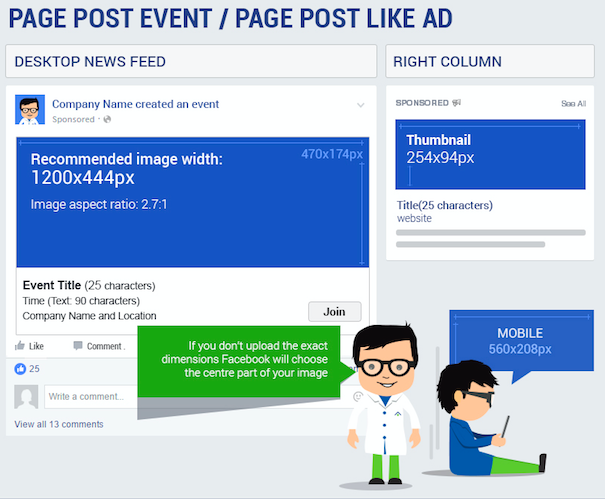 Businesses often use Facebook ads to drive more engagement to their Facebook posts. These types of meta campaigns allow marketers to reach more audiences, gain more likes, comments, video views or even post shares. The recommended size for images used in Page Post Engagement campaigns is 1200 x 900 pixels with an image ratio of 4:3 on the desktop. The images are displayed at up to 470 x 470 pixels on desktop and up to 628 x 840 pixels on mobile. It’s important to note that Facebook will scale to fit the longest edge. 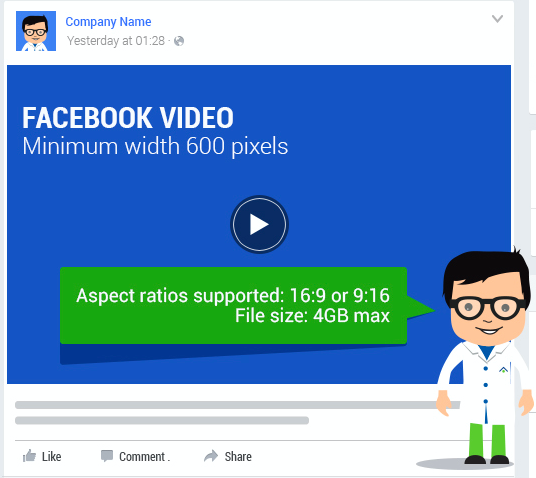 High profile videos are favored in Facebook ads, so video quality of 1080 pixels at a maximum size of 4GB is best. Facebook allows videos of up to 120 minutes, but anything that is less than 30 seconds will loop continuously for up to 90 seconds. Sometimes, videos are not automatically played, therefore, it is recommended to upload an image with a minimum resolution of 600 x 315 pixels as the video thumbnail. 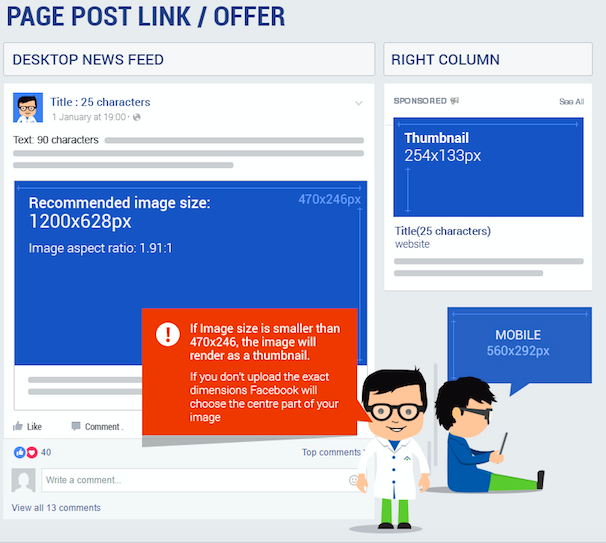 When promoting your page to attract more Facebook fans, we recommend uploading an image that is 1200 x 444 pixels. 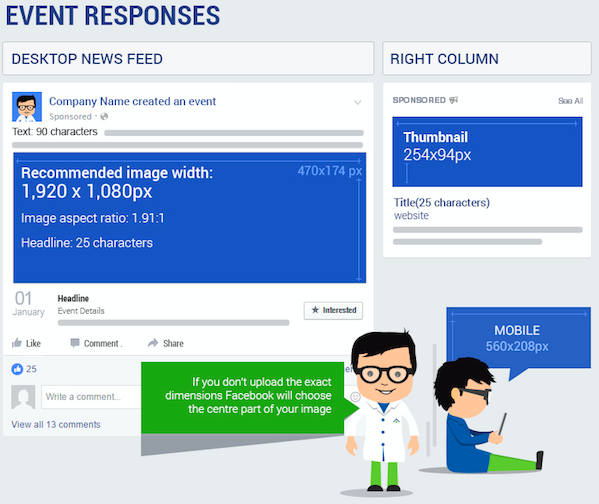 Here again, if an image with an incorrect size is uploaded, Facebook will automatically choose the center-part of your image, which can distort the visual quality and campaign results. Whether you are hosting an event online or in-store, you can promote it on Facebook. Ensure you’re uploading high-quality with these dimensions: 1920 x 1080 pixels. You can drive more people to your event by choosing an image that is related to your copy or the theme of your event. 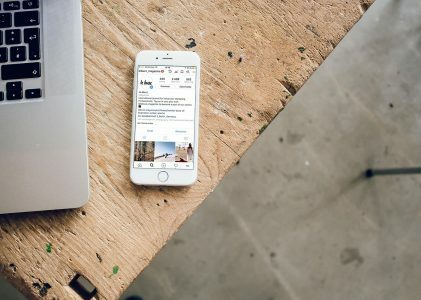 Desktop and mobile apps are becoming increasingly popular to help increase downloads for both mobile and computer applications. 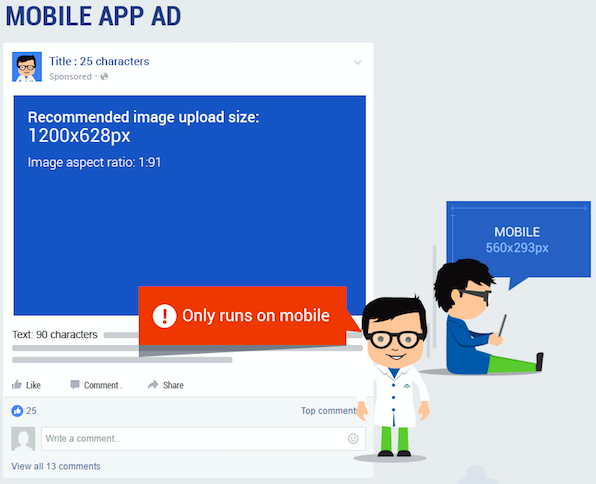 Although the image size recommendations are the same for both types of app-download campaigns, promotion of mobile apps (Android, iOS and the like) only run on mobile. Desktop app advertisements however will display on both mobile and desktop. The recommended image size for app promotion advertisements is 1200 x 628 pixels. 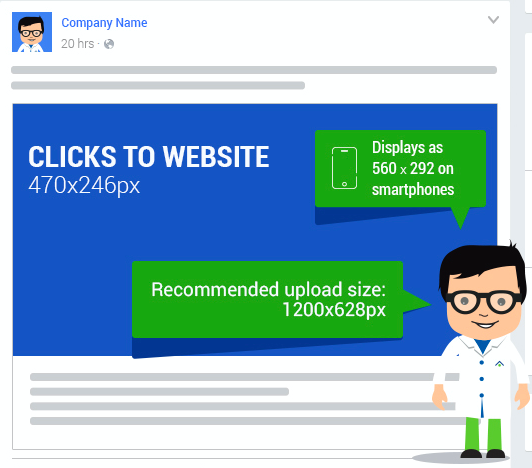 Similar to a Page Post campaign, images that are less than 470 x 246 pixels in size will be rendered as a thumbnail. 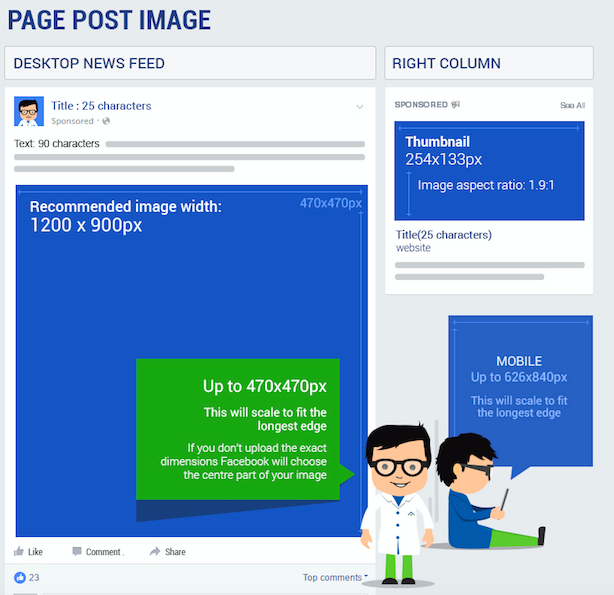 Now that you have a guide to optimizing Facebook images, you can get your perfectionist on and ensure high quality visuals everywhere on Facebook! If you’re a business that is using Facebook as a marketing channel, you can get advanced strategies to Facebook advertising in Acquisio’s latest eBook, free for download and complete with a Facebook Marketer’s Checklist! All screenshots taken March 2017 from the TechWyse Infographic.